Let me set the scene for you: At the end of regulation, the Saints and Colts are tied at 48 in what has already been proclaimed the Greatest Sporting Event in the History of the West. In overtime, however, whoever wins the coin toss unimpressively moves 35 yards down the field and anticlimactically kicks a championship-winning field goal. Its status as GSEHW is quickly revoked and handed back, somewhat perplexingly, to the Toronto Blue Jays’ 4-3 win over the Texas Rangers from June 17, 1995. Let me reset the scene for you: At the end of regulation, the Saints and Colts are tied at 48 in what has already been proclaimed the Greatest Sporting Event in the History of the West. The drama doesn’t cease there but rather builds to an astonishing Wagnerian crescendo in overtime, where one of the teams finally crosses the goal line to claim the Lombardi Trophy. The game’s status as GSEHW is not only confirmed but changed slightly, with “West” being replaced by “World.” This is possible because, finally and logically, we have changed the rules that govern overtime in the National Football League. There is no secret that overtime in the NFL is broken. 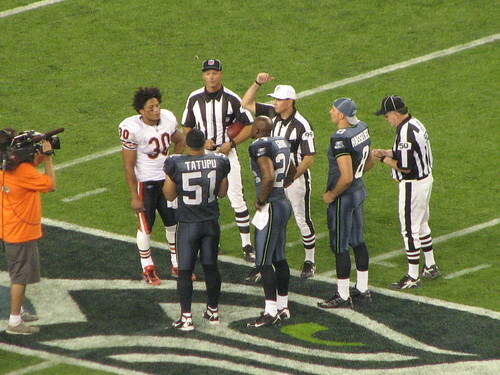 The team that wins the coin toss wins an alarming amount of the time—close to 60 percent since 2000. Despite a prominent countryman of mine’s firm belief that chance is the only reasonable divinity (Tim’s favorite, Camus, although I doubt he understands the complexity of The Fall) or a not-so-prominent co-blogger of mine’s own investigation into the morality of the coin toss, the outcome of football games should not rest on the flick of a referee’s finger.